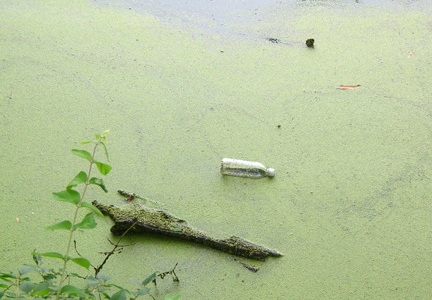 The littered plight of Percy Priest Lake has been in the news this week. Another clean up is scheduled for September 13, but the problem is too large to be solved in a day. Yesterday, my husband and I were walking at Radnor Lake, one of our favorite places to hike in Nashville. When I brought up the trash situation at Percy Priest Lake, John suggested that Percy Priest should become no access to gas-powered watercraft or campers to control the litter problem. Radnor Lake is treated like a sanctuary with no boating except ranger-sponsored canoe rides. There is no camping or picnicking. 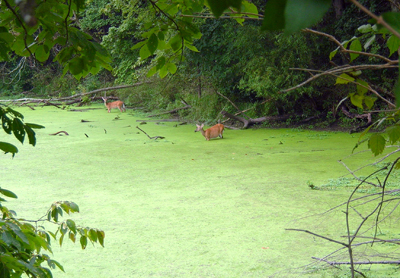 Dogs aren’t allowed on the trails around the lake, as deer and other wildlife are plentiful there. Yesterday, we saw an otter by the road and a doe and her fawn on the trail. I cradled a millipede and moved it off the roadway so that it wouldn’t be crushed by hikers, strollers or dogs. For many years now, Percy Priest Lake has been geared toward recreational water sports, including boating, jet skiing, fishing, swimming and camping. It has become a trash dump. This is a hazard to wildlife and to us, as polluted water makes its way into our drinking water supply. I suggest that every boater bring a bag or two of litter off the lake and its islands each time that they enjoy the water. Today, the Nashville Clean Water Project is taking responsibility for cleaning up the lake, but it’s the responsibility of each of us to do our part. The groups who want to protect their usage of the lake for water fun need to step up to clean the lake and to keep it clean. I’ve mentioned many times that Radnor Lake is my most favorite place in the world. We go there a lot to reconnect with nature and with God. We visited yesterday morning for our spiritual renewal. After the heavy overnight rain, the lake was very refreshing. We saw a doe with her fawn grazing along the trail around the lake. Unfortunately on the roadside of the lake, my husband pointed out this sad sight, a plastic water bottle floating in the duckweed. Not only is the plastic bottle detrimental to the life in the lake, eventually the plastic bottle will wash away to the Great Pacific Garbage Patch. Why the image of the wild rabbit for a day normally illustrated with red, white and blue banners and flags? Because that’s what I’m going to do today to celebrate my life in the United States. We’re going to enjoy the natural beauty with a hike along Radnor Lake or one of the metro greenways. Hopefully we’ll see deer, turtles, snakes and a variety of birds. Rabbits are symbols of rebirth and resurrection. We have the opportunity to change our direction of excessive overconsumption in the US. Let’s learn to reduce, reuse and recycle. This bunny and its offspring deserve a safe environment. Enjoy the fourth in a traditional toast with fireworks and cookouts if you wish. Please remember the environment and clean up after yourselves. 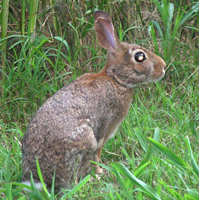 This rabbit was photographed along the Riverwalk Greenway in Bellevue. After we had walked Radnor Lake and Ganier Ridge, we hit the road heading back to the parking lot. Unfortunately, we found this grocery bag along the side of the road by the lake. We assumed that someone bagged their dog’s poop and left the bag there for someone else to carry back to the trash can in the parking lot and ranger’s station. The ranger once told us that folks do that all the time. They bag the poop as they are supposed to do but leave it by the roadside. 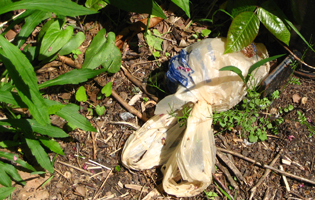 Personally, I rather just see a big pile of dog poop than see a plastic bag of dog poop. As long as I don’t step in it!